Burundi's government has asked its people to donate money to help with controversial elections scheduled for June. The appeal for funds were made on the government's official Facebook page. It comes after the European Union said it will withhold more than $2m (£1.3m) of funding for the elections. There have been weeks of violent protests and a failed coup against President Pierre Nkurunziza's bid for a third term. The plea asks for money "from patriotic citizens to reinforce a culture of democracy based on the choice of the people". It then gives details of a bank account to put the money directly into. Money to carry out the the elections was already running low as the former colonial power Belgium has also suspended a similar amount to the EU. The EU said it will withhold the money unless "conditions for a free, peaceful and credible election are secured". In addition, a French diplomat told AFP news agency that France has suspended its security co-operation with the country. The parliamentary elections were due to be held on Tuesday but have been delayed by 10 days. 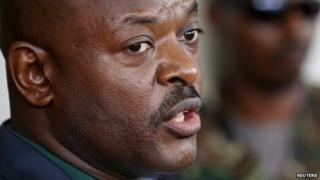 Mr Nkurunziza's critics say the third term contravenes the constitution, which requires him to step down after two terms. Burundi's Constitutional Court says that Mr Nkurunziza's first term does not count because he was elected by parliament and not voters. What’s behind the coup bid?